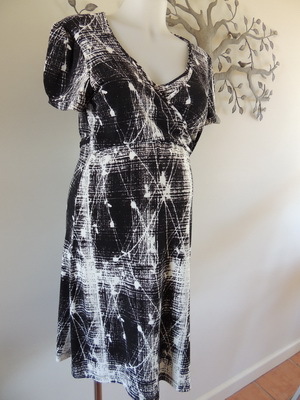 This clever dress is designed to be worn during and after pregnancy and it is in a gorgeous print. It is new with tags by Ninth Moon. There is plenty of stretch in the soft fabric which is in an abstract black and white print. It has a short sleeve and is a flattering wraparound style and is perfect for breastfeeding. Be the first to review “NEW Black and White Print Wrap Feeding Dress” Click here to cancel reply.